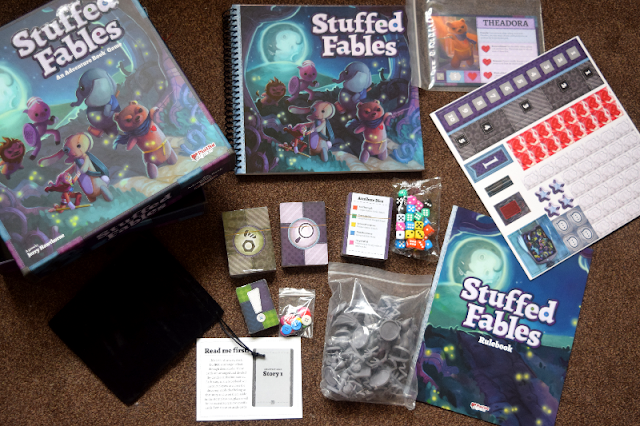 Our second Board Game Club game this month was Stuffed Fables. 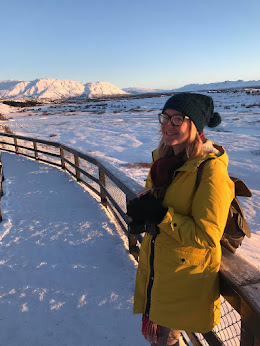 On first impressions, we thought the game sounded really interesting and were really excited to try it out. 'Sworn to protect the little girl that loves them, a group of stuffed toys has been drawn into the Fall, an otherworldly, fantastic realm ruled by a brooding master of nightmares'. 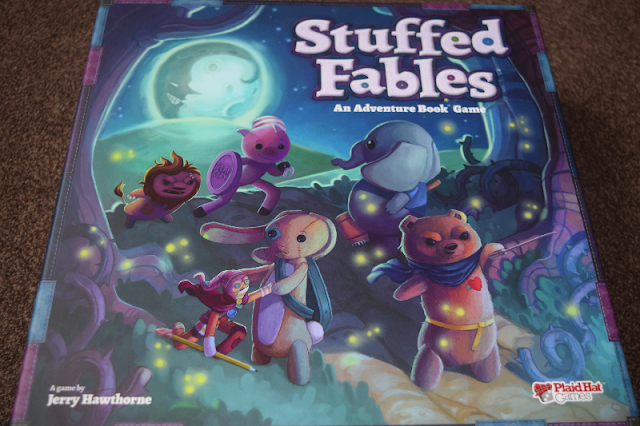 Stuffed Fables is an unusual adventure game in which players take on the roles of brave stuffies seeking to save the child they love from a scheming evil mastermind. 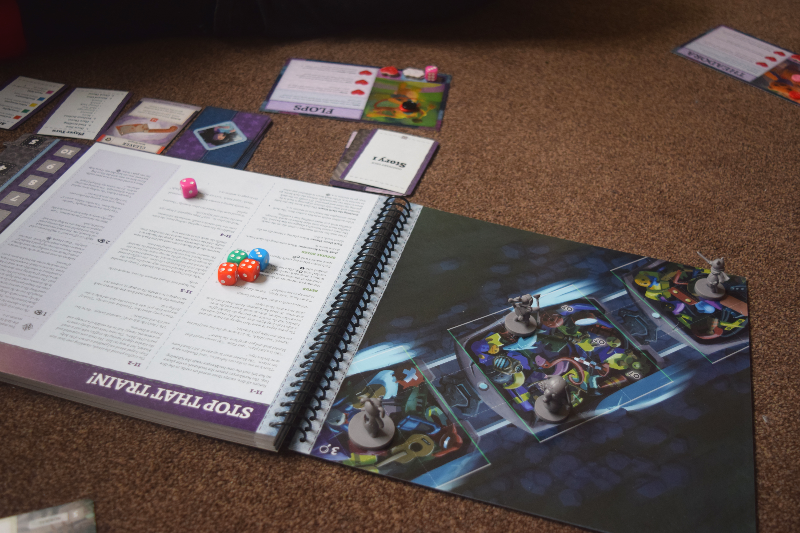 All of the action takes place in the unique storybook- a book that acts as your rules reference, story guide, and game board, all in one! The game comes with lots of different pieces as you can see above; including different kinds of cards used throughout the story, character pieces, dice, buttons etc. There are detailed instructions which explain what each item is used for and explaining the rules throughout each part of the story. The game is quite complicated and so including setting up and reading the instructions as we play, we found that it is very time consuming and that we had been playing for hours and still seemed to be so far off completing the game. It is a shame that there is so much to set up that it wouldn't be easy to pick up where you left off after packing away. I did really enjoy the working as a team element of the game as that is something we don't usually do. We are a very competitive family and so are always playing games that involve competing against each other. It was nice to be able to discuss possible moves before deciding what to do and Gracie found it surprisingly fun too. I thought it may be too difficult for her despite being 7+ but I think playing as a team made it much easier for her to understand. The game and pieces are amazing quality. I was surprised at the price range until I opened up the box and saw everything that was included. There is so much detail that has been put into every part of the game and you really do notice that. I do however, think that the storage box should have had more compartments so all of the cards don't get mixed up between uses. That way it could be a lot easier to set up each time. Stuffed Fables is a very 'different' game. I really enjoyed the gameplay itself but it is very time-consuming and so you would need to have a lot of free hours to be able to sit and play properly. We found it quite frustrating that we spent hours playing yet didn't actually get very far. I think maybe once we have moved house and are settled, we will try and find some time to give the game another go and see if we enjoy it more next time seems as we will already know the basic set up of the game.